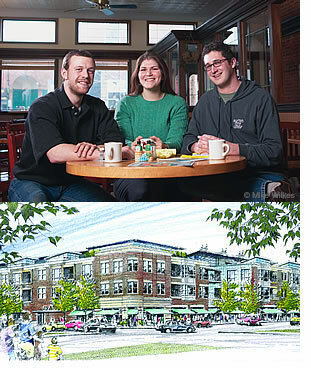 Ben, Naomi and Josh knew their town of Oberlin, OH was lacking the kind of housing and businesses that kept their university peers from leaving after graduation. Not only did they stay, they formed Sustainable Community Associates and rather spontaneously began to develop the kind of place that would excite their friends about staying as well. One of their biggest assets as developers was that no one knew the market better than they did. Through a sheer determination to learn, valued mentors, maxed-out credit cards and a passion for building something that stood for what their generation believed in, they gradually turned an empty site they casually walked by for years into what will soon be a ground-breaking for a $15 million mixed-use urban village. – Green building: solar panels, green roof, and geothermal heating. Their detailed story is told here in Oberlin Alumni Magazine, and source for these images. A CoolTown interview with Ben can be found here. For someone that has no real background or experience starting a project like this, what would you say are the first steps to take to get something like this rolling? I often have great ideas but I am alone and a little bewildered on how to start.